I have been asked to have a look at the proposed technology and comment on what I could find out about it. The question confronting the town’s decision makers is (or should be): Is there convincing proof that REM’s proposal to develop a GASIFICATION plant using the ENTECH method would be of net benefit to the citizens of Port Hope. Gasification is a chemical process. It is therefore legitimate that it should be scrutinised from the scientific and medical point of view, and it is from this viewpoint that I am commenting. The message I wish to convey, and which should be conveyed to the decision makers in this town by us the people, to guide them in this determination, is very simple. It comprises: First: One concise statement that captures the core issue; and Second: A brief analysis of that statement. 1. Statement: Nothing comes from nothing; nothing disappears into nothingness. You can not make stuff appear from nowhere and you can’t make stuff disappear into nowhere. This was known to the Ancient Greeks; science now knows it as the Law of Conservation of Mass. The relevance of this to the REM proposal is: There is no system that can process waste and produce zero toxic residual. So the issue is then: can the toxic residual material be captured, and so prevent release of harmful emissions into the environment? When analysing Waste Gasification in terms of the Law of Conservation of Mass I like to borrow a phrase from the computer industry: Garbage in – garbage out. It is in the nature of the Gasification Process that it Requires compostable waste and water. Here we have two important points: First: Where is the water going to come from? Second: The process can not function without compostable material. 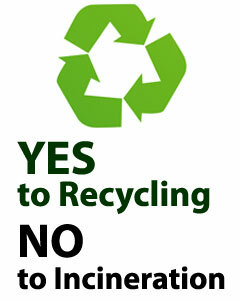 But composting, with recycling, is one of the only safe and energy efficient ways that we have for dealing with waste. This means that if this business initiative is approved, any composting programme that Port Hope or the other areas concerned may have contemplated, will not materialise now or ever. Composting is green, natural, environmentally friendly and energy efficient. If we agree that the town should be green we can surely also agree that what can be composted, should be. That was an overview of what goes in. Now lets look at what comes OUT from gasification of waste: First: An explanation of what gasification is. Gasification is chemical breakdown of waste at a high temperature, but at a low concentration of oxygen. The temperatures used are high enough for combustion (burning) but because of the low oxygen level the actual process does not involve combustion and for this reason differs from incineration. Proponents of gasification emphasise this difference, because it is said that emissions are produced by incineration that are avoided when using gasification. Gasification leads to the production of a mixture of gasses called syngas (synthesis gas). This mixture comprises hydrogen (which is explosive), carbon monoxide (a lethal poison), carbon dioxide (the major greenhouse gas) and methane (also a greenhouse gas), as well as hydrogen sulphide, which is very poisonous and smells like rotten eggs, and ammonia, which is caustic and hazardous to humans. Syngas can be used to produce energy, but it is about ¼ to ½ as efficient as natural gas. To produce energy, syngas is combusted – that is, it is burned, as in incineration, potentially producing emissions comparable to those that were being avoided by not incinerating the waste in the first instance. These gassy emissions are released through chimney stacks in to the air. And as is generally known, gasses in air do not stay where you put them. Air moves as the wind blows; and the wind blows from the West – that is, from Wesleyville Road – to the East – that is, to where we are all sitting right now, as we speak. The emissions released will vary with the precise set-up of the method and the nature of the material being processed. With respect to the REM proposal these are unknowns. The toxins that can be released are far too numerous for me to give a complete list here – I will mention only a few. They include the furans and dioxins, which are cancer producing, hydrochloric acid (highly caustic); carbon monoxide (a lethal poison); mercury (highly toxic to the nervous system, especially in infants and children); the greenhouse gasses carbon dioxide and methane, and many more chemical substances as well as a recently discovered type of particulate matter called nanoparticles, which carry these poisons. Nanoparticles are particles that are of the order of size of a few nanometres. For those few of you who are not familiar with metric terminology: A nanometre is about a millionth of the size of a pinhead. We are talking of contaminant particles, some few millionths of a pinhead in size, which contain some of the most highly dangerous toxins – so, in effect, they are minute poison missiles which can be breathed in by people living in the area toward which the wind blows. When we breath in air, it goes down in to the small pockets of the lungs, called alveoli. Here the oxygen of the air passes through minute openings in the lining of the alveoli called pores, and in to the blood vessels. Because the pores are minute they act as a filter, normally letting through only the oxygen molecules, but no pollutant material, and this has served humans well for a few million years, because the pores are only some few nanometres in diameter and until now no poisonous pollutants of nanometre size have been around. But now, nanoparticles exist, and they can get in to your blood stream and your internal organs including your brain, and they could be coming to a town near you. I emphasise First: that this is not a statement by an academic theorist in his or her ivory tower, isolated from the real world, but a report developed commercially by a company operating in the environmental industry itself; Second: it specifically refers to the Entech methodology; and Third: the date is July of this year. Cancers, which are caused by genetic mutations; genetic mutations to the germ cells, that could potentially produce cancers and birth deformities in the next generations – the town’s children and their children; effects on the nervous system causing mental deficiency and paralysis; respiratory system disease and heart disease in the elderly; and much more. With a new and untested system such as this one it could take many years to work out the glitches and troubleshoot the problems. If this is allowed to proceed at this time, Port Hope citizens would be the guinea-pigs in an uncontrolled experiment. Environmental standards for noxious substances and effects are notoriously lax at the best of times, but knowledge about nanoparticles is so new that there are currently no government regulations on release of nanoparticles into the air. In this as in many other cases, governments and government agencies are far behind science, and individual vendors of services are free to pursue their profit interests with no control in respect of human health concerns. In situations such as this it is up to the citizens to take charge themselves. NOTE: If you use the template letter, please add some personal comments to it! Volunteer your time AND/OR make a donation! Northumberland News 2015 Newsmaker of the Year! !